The Town of Independence is applying for funding that will include Town Park. If you are so inclined, please send a letter of support to our Town Manager Reid Walters BEFORE the end of February. Here are all the details and thanks! Independence is applying for a Community Development Block Grant from the Virginia Department of Housing and Community Development for the Independence Downtown Revitalization Project. The main components of the application involve streetscape improvements and site development for our town park. The streetscape component will provide the aesthetic attributes needed for our main street. This may include sidewalk improvements, flower boxes, improved lighting and wayfinding signage. The town park, will be located on the town lot directly across the street of the historic 1908 Courthouse. 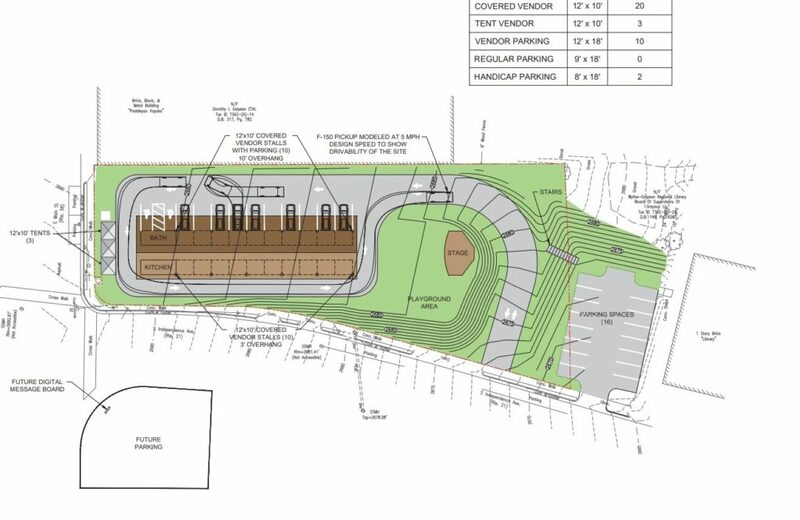 A large open-air multiuse shelter will be constructed which will host the Independence Farmers Market and will serve as the hub for town events. The ‘Uncle Wade Old-time Stage’ will serve as a stage area for music and cultural events. Additionally, a playground will be placed beside the Grayson County Library, providing a much-needed addition to the core area of Independence. Additional funding may be needed to accomplish the entire scope of this project. A letter of support for the Community Development Block Grant (CDBG) will greatly be appreciated. The grant deadline is March 2019. This entry was posted in Uncategorized and tagged community development, town park. Bookmark the permalink.